The Valiant was the first of the Royal Air Force V-Force bombers to enter service. Designed as a strategic nuclear strike aircraft, the Valiant's career ended early after a change to low-level flying revealed corrosion in the wing spar. 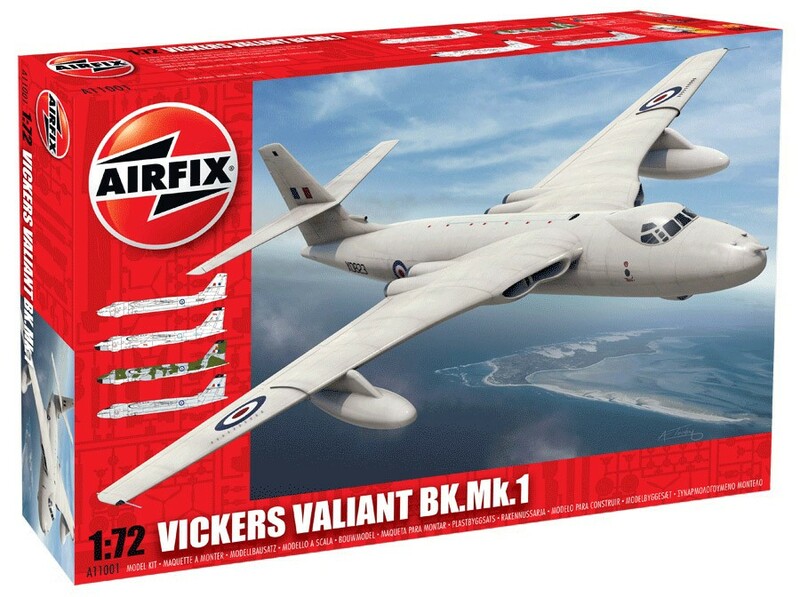 Airfix's Valiant is a big model of a big plane. Molded in blue-gray plastic, the parts show recessed panel lines that are a little deep and wide, but crisp. The molded detail such as the speed brakes is sharp and the thinness of the wing fences and vortex-generator vanes the finest I've seen. Options include posable crew hatch, separate control surfaces (except the flaps), different noses and tails. Decal options include an all-white aircraft used during Operation Grapple nuclear tests, an operational all-white aircraft with low-visibility markings, a camouflaged bird from 1963, and the second prototype in overall aluminum. The interior includes the upper and lower decks with crew seats, control yokes, and decal instrument panels. The pilots' seats have molded-on harnesses. Everything fits well and the large locator tabs make alignment a snap, especially when gluing the cockpit into the right fuselage half. The two cabin windows fit neatly. The gear wells have rib detail, and they fit perfectly. The kit provides several options for the large bomb bay. You can leave it closed, or open with either the Blue Danube nuclear bomb or two dozen 1,000 pound bombs. The instructions are clear about which ordnance is right for the different marking options. If you build the bay closed, Airfix supplies several plastic bulkheads to make the fuselage more rigid. They also provide optional parts for the belly, aft of the bay, to replicate the panel that slides up to improve airflow. I built the bay open, but left the nuke out for painting. The fuselage went together perfectly despite all of the bits and pieces that need to be in just the right place. Don't forget to add weight up front; the instructions call for 22 grams. I used a lead tire-balance weight to be sure. The only fit problem I had was the intakes. The upper and lower halves go together well, but the seams are obvious and hard to fill and sand. To eliminate the gaps, I applied tape to the rear ends and poured white acrylic paint into the intakes, turning them over several times to coat the sides before removing the tape and letting the paint drain out. I fretted about the fit of the wing, but my concerns melted away when I slotted it into position. The one-piece upper wings sets the anhedral, forms the upper fuselage, and fits mostly along panel lines. I used a little Mr. Surfacer 500 and sanding at the back where the parts joined in the middle of a panel. I also added super glue to the wing edges to eliminate seams. The fit of the exhaust fairings to the wings was less than perfect and needed filling and sanding to clean up. The canopies fit exactly, and the distinct frame moldings made masking easy. To finish my Valiant as an anti-flash white aircraft from No. 49 Squadron, I base-coated with gloss aluminum and flat white to aid coverage and hide the dark plastic and filler, then painted with Tamiya spray-can pure white. The Cartograf decals (thanks, Airfix!) are thin, perfectly printed, and lay down over detail with a little Micro Set. Be prepared to spend a couple nights with the decals because of all the tiny (yet legible) stencils. Airfix has hit one out of the park with the Valiant. Not only is the finished model impressively large more than 18" in length and span but the engineering, options, and fit are top-notch and make for an enjoyable building experience. The Valiant was the first of the Royal Air Force V-Force bom ..